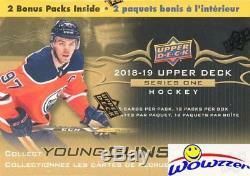 2018/19 Upper Deck Series 1 Hockey Factory Sealed 20 Box CASE-40 YOUNG GUN RCS. 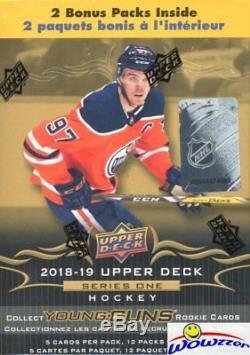 We are proud to offer this Brand New 2018/19 Upper Deck Series 1 NHL Hockey EXCLUSIVE Factory Sealed CASE! This Factory Sealed CASE includes TWENTY(20) EXCLUSIVE Factory Sealed Blaster Boxes! 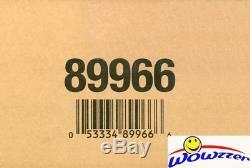 Each of these HUGE Factory Sealed Box includes 12 Pack and 5 cards per Pack! Plus on Average you GET TWO(2) YOUNG GUNS Rookies In Each of these Factory Sealed Boxes! Total of FORTY(40) YOUNG GUN ROOKIES in these 20 Box Factory Sealed CASE! Look for Young Gun Rookie Cards of Top Young Stars including Elias Pettersson, Rasmus Dahlin, Jesperi Kotkeniemi, Travis Demott, Brett Howden, Ryan Donato, Max Camtois, Neal Pionk and Many More! Plus Every Box on Average includes One Shooting Stars Insert Card! Look for Super Popular UD Canvas and Young Guns Canvas Cards! Collect the Entire UD Portrait Set Featuring Superstars and Rookies! Look for Upper Deck Game Jersey Cards with Bigger than Ever Memorabilia Swatches! Good Luck with your pulls! On Listing for Beckett BGS Graded Cards. We answer all emails within about 24 hours Monday through Friday. We are an Internet only company; we do not have a retail location. Get business information that counts! - Vendio Counters are active content free. The item "2018/19 Upper Deck Series 1 Hockey Factory Sealed 20 Box CASE-40 YOUNG GUN RCS" is in sale since Tuesday, November 20, 2018. This item is in the category "Sports Mem, Cards & Fan Shop\Sports Trading Cards\Ice Hockey Cards". The seller is "wowzzer" and is located in Santa Ana, California. This item can be shipped worldwide.